Adapted from the book by Ludovic Kennedy, 10 Rillington Place tells the chilling story of one of Britain's most notorious serial killers - John Reginald Halliday Christie. The quietly spoken Christie was an ex-WW1 service-man and while he presented a respectable, responsible veneer to the world, beneath the superficial control lurked a bundle of serious personality problems; the most dangerous of which was sexual psychopathy. After an apparently troubled childhood, Christie had indulged in some petty crime in early adulthood but gave it up after he was imprisoned for three months for viciously hitting a prostitute over the head with a cricket bat. He did however, continue to visit prostitutes and indeed, his first victim, Ruth Fuerst, was a munitions worker and part-time prostitute. During WW2 he applied --and because the relevant authorities had failed to check his record, was accepted-- as a Special Constabulary, resigning after the first Fuerst murder, no doubt conscious of the incompatibility of the two careers. He later worked as a clerk at a radio factory. No.10: In a squalid area of post-war London, at the end of a row of bleak, uniform Victorian houses and adjacent to a factory wall, stood 10 Rillington Place. The grimy, peeling, ground floor apartment of the building had been home to Christie and his wife Ethel since 1938 and from 1940 to his arrest in 1953, Christie murdered at least six women, one of whom was Ethel, burying their bodies in the walls of his apartment, under the floorboards or in the garden. One of these murders, in 1949, was particularly controversial as many believe an innocent man was sent to the gallows for it and it's this tragic injustice that is the focus of the film. 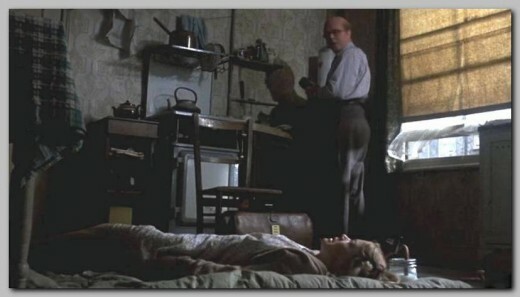 Fleischer's 10 Rillington Place was designed with the knowledge that there would be few plot surprises for the viewer, since most Britains at least, were familiar with the events. Yet there is still plenty of suspense and the notoriety of the crimes only seems to make the film more riveting - no doubt because we know this is a representation of something that really happened. Set-up – Christie is established as a psychotic killer, luring women into his apartment with the false promise of 'medical treatments'. 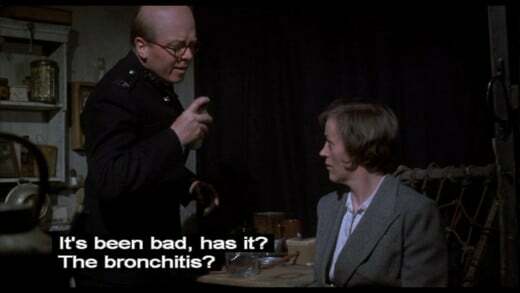 Posing as an ex medical student, Christie befriends the newly arrived upstairs tenants, a young couple, Tim and Beryl, who are stressed and financially strapped with one baby in tow and another on the way. He offers them a solution in the form of one of his 'medical treatments', in this case a pregnancy termination. Tim is unsure but finally relents after assurances from Christie and Beryl that it's "the right thing to do". Plot Point – Christie murders Beryl in a sexual asphyxiation frenzy and tells Tim it's the result of an earlier botched abortion attempt. He convinces Tim to hand over the baby and run away to escape prosecution. Feeling guilty Tim eventually hands himself over to the police, still believing his wife's death was an accident and that his baby is safely ensconced somewhere in the countryside with a “loving couple”. The truth is revealed by police – his wife and baby were murdered. Tim is charged with murder and sent to trial, now fully aware of Christie's culpability. During the trial Christie behaves like a model of civic responsibility and Tim's pleas of innocence go unheeded. Christie's wife attempts to leave him, but is murdered and he's now alone, free to indulge his heinous appetites. Completely devoured by his obsessions, he loses everything and is homeless, but not before committing several more murders. New tenants at Rillington Place uncover the bodies in a wall during renovations and the police search for Christie. Pathetic and powerless, Christie is picked up on London Bridge by a local constable and arrested. Tim is granted a posthumous pardon. Within this simple structure, complex events unfold. Suspense develops quietly but unrelentingly and a creeping sense of foreboding remains with the viewer right to the end of the story. Scenes merge smoothly into another like perfect gear changes and the dramatic tension is helped along in no small part due to a staggeringly convincing performance by Richard Attenborough as Christie. 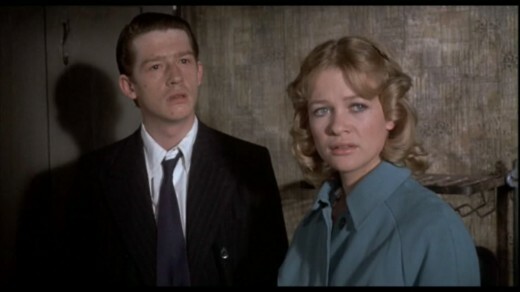 John Hurt too, does a very fine job as the almost childlike, naive Tim and the supporting cast is faultless. According to some sources, the real Timothy Evans, while possessing an unpredictable temper, had the mental age of a boy of eleven.